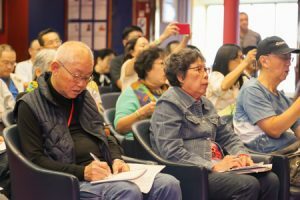 Japanese language classes onboard are very popular for participants coming from many places including China, Taiwan, Singapore, Malaysia and Korea. Today there was a special lesson on the Japanese alphabet, “Hiragana.” A participant shared the comment, “I want to learn much more about Japanese language and culture.” Everyone is trying very hard, taking notes and even photographing and filming the class. This is a great scene showing how you can enjoy learning new things on Peace Boat. The language classes will continue throughout the voyage! [99th Cruise Report]A star is born!